Those colors are awesome together (and your dog is adorable)! I love that jacket and turtle neck combo! I think turtle necks are a staple part of my winter wardrobe. I wear them under a lot of my dresses to make them seasonally appropriate. That houndstooth jacket is fantastic! I'd love to have one like that in my wardrobe. Wonderful cold weather outfit! I love the blazer - especially the houndstooth print. Oh so classic. And those shoes are absolutely adorable. I have been on the hunt for something just like them. Love it! I love the turtleneck, but that jacket just takes the cake! 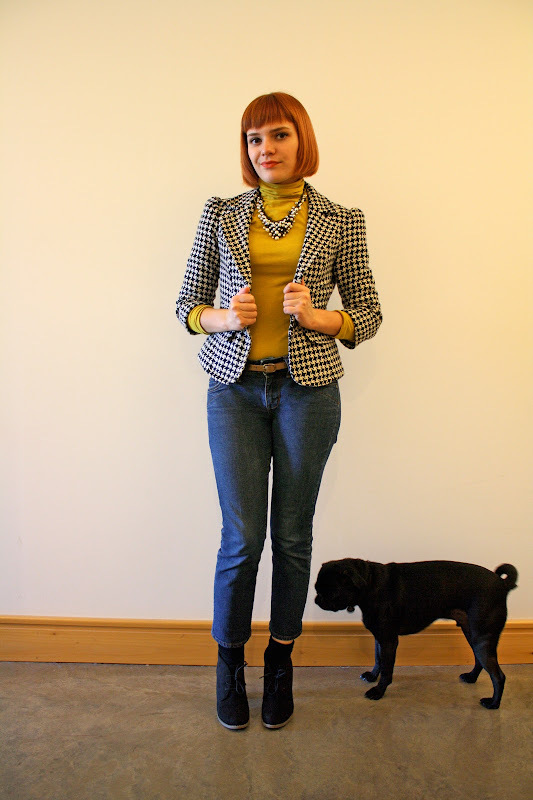 I love how dogs insist on appearing on blog posts. Mine has done that too. Love your houndstooth jacket. Very stylish outfit.